Hi all! Welcome to my stop on the Thankful for the MISTI Blog Hop! Today I've got a project with only a little stamping on it, but that stamping is perfect, thanks to the MISTI! I used a cutting file from Lori Whitlock called Flexi Card Turkey, some patterned papers from Doodlebug, and a sentiment from Neat & Tangled. I had assembled most of the card before I decided where to put the sentiment, so I used my Mini MISTI to help stamp the sentiment on the layered card. It didn't come out perfectly on the first try, so I just inked up the stamp again and re-stamped it for the perfect saying on my Thanksgiving card. 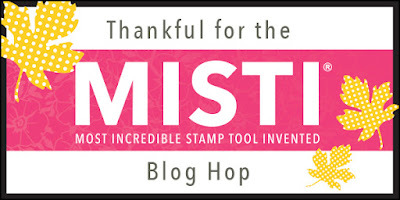 I'm so thankful for the MISTI for several reasons - I never have to worry about poorly stamped images because I can always re-stamp and make them perfect, I waste so much less supplies because I can make everything exactly how I want it the first time, and most of all, I'm grateful to have met Iliana because of my love of the MISTI! She's such a super wonderful person and I'm so glad to know her and call her my friend! Of course there's an awesome giveaway: Not 1, but 2 MISTIs (choice of original or mini) will be given away - 1 to the winner and 1 to a friend or relative they are thankful for!! How great is that?! 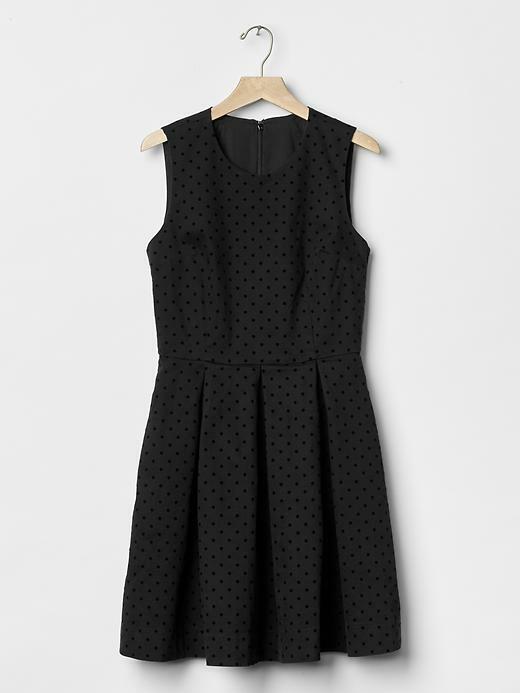 You can leave comments on all the blogs in the hop until Sunday, November 27, and a winner will be drawn on Monday. I hope you liked my project and that you'll visit all the blogs on our hop! Don't forget to leave a comment before you go and happy hopping! Hi everybody! Welcome to my stop on the hop! I'm going to admit something here - I ran out of time and so I'm doing a super fast blog post! I die cut 8 butterflies and then used one of the negative pieces to line up my stamp to cover the die cut exactly how I wanted. 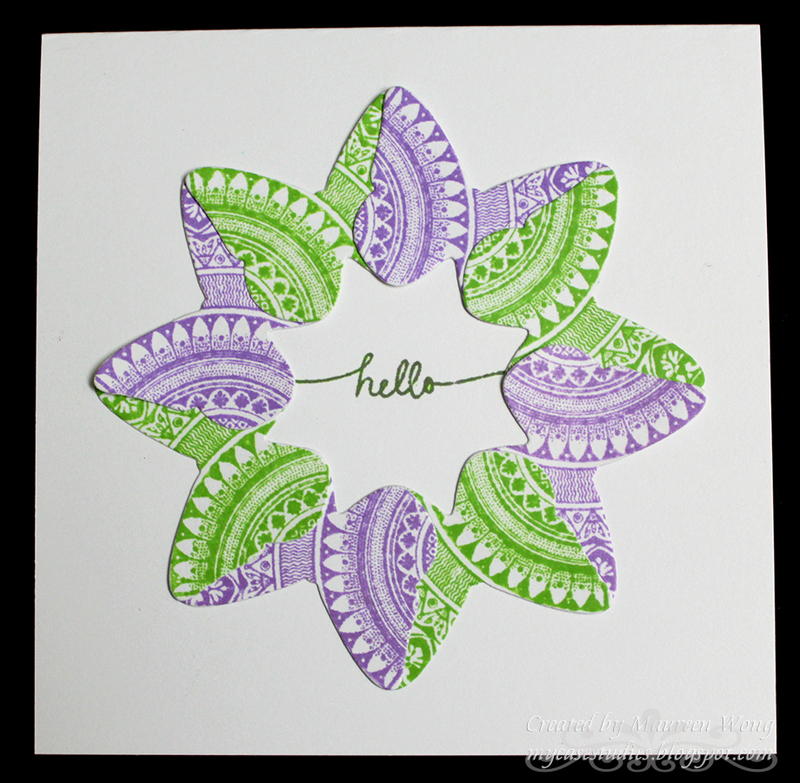 Then I taped the negative piece down in my Mini MISTI and stamped them half in green ink and half in purple ink. Next I arranged all the die cuts into a circle and adhered them together. 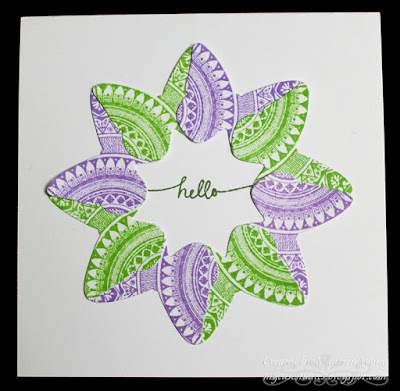 Finally I added a small sentiment in the center using both inks (done with the Mini MISTI) to get a perfect match! You'll want to leave comments on every stop on the hop because on Wednesday, October 12th we will draw from everyone who leaves a comment on ALL the blogs in the hop to give away a mini MISTI and a $25 IO gift certificate. Winners will be posted on the IO & MSP blogs and FB pages. Thanks for stopping by and don't forget to leave a comment! Hi all! I have a non-stamping post today because I wanted to share that I signed up to be a Perfectly Posh consultant! Yay! If you want to check out the pampering products that we sell, here's my referral link. If you're interested in samples and secret specials and info, please join my VIP page for my Posh customers. 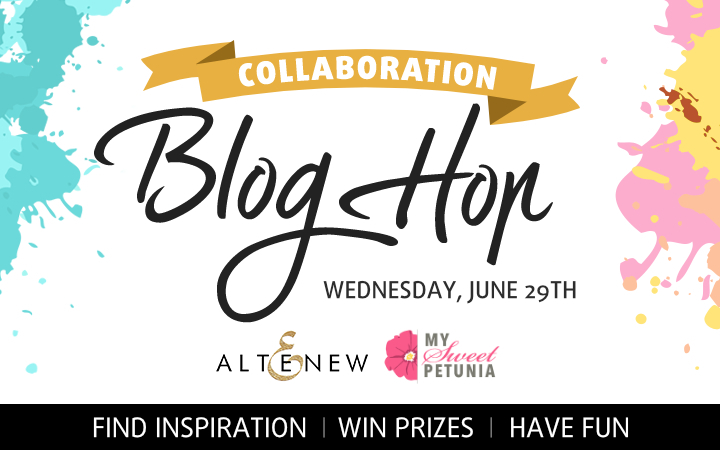 Altenew and MISTI Blog Hop! Hi all! Welcome to my stop on the Hop! If you've been following the links, then you've arrived here from Yoonsun Hur's blog. If you just happened upon my blog, you'll want to start at the Altenew blog because there is much to see and stuff to win! There are TWO mini MISTIs from My Sweet Petunia and THREE $30 gift certificates from Altenew up for grabs. Winners will be picked randomly from the comments across all of the blogs in the hop. Winners will be announced on the My Sweet Petunia and Altenew blogs on July 3, 2016. And I want to mention an exclusive offer for My Sweet Petunia fans/followers/readers to celebrate our collaboration: Get 10 % off your entire order at www.altenew.com with code ALTENEWLOVESMISTI at check out. Offer ends on July 01 at midnight EST. I don't want to take up any more of your precious time, so please leave me a comment and hop along to Lydia Evans' blog! Enjoy! Hi all! Welcome to my post for the Chameleon Pens and MISTI hop! Today I have a relatively Clean & Simple card, but I think it looks really complicated because of the magic of the Chameleon Pens! 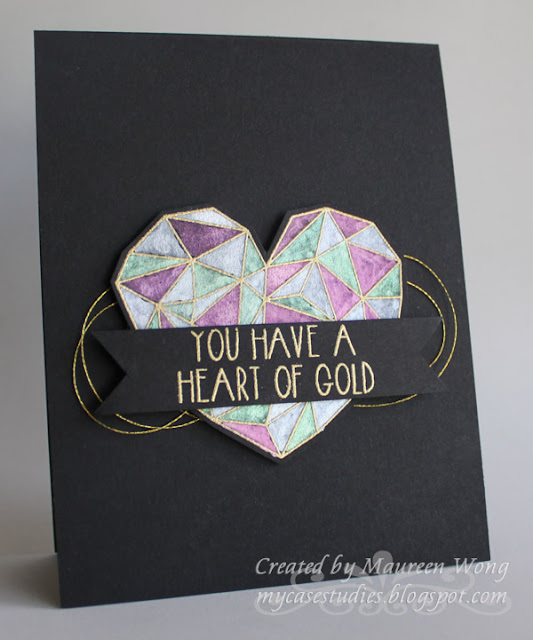 Here's how I did it: Using my Mini MISTI, I stamped the heart from Heart of Gold in Memento Black ink. I left the stamp in place and removed my stamped image. Then I used the Cool Tones set to color in all the little triangles in the image. Finally, I put the panel back in my Mini MISTI. Before overstamping, I added the sentiment above the image then inked both up with Versamark ink. I embossed with detail gold embossing powder. You can win a MISTI of your very own (your choice of Mini or Original size) just by commenting on all the blogs each Friday for 3 weeks! Or you can win a 5 pack pen set of your choice by leaving a comment on the Chameleon Blog and signing up for their newsletter! Congratulations Karen D.!!! 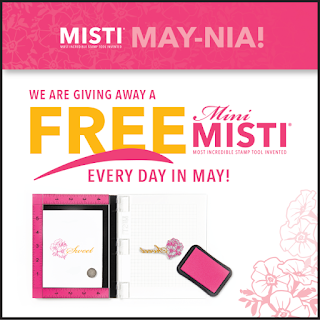 I've sent an email so you should be playing with your new Mini MISTI in just a short while! Enjoy! 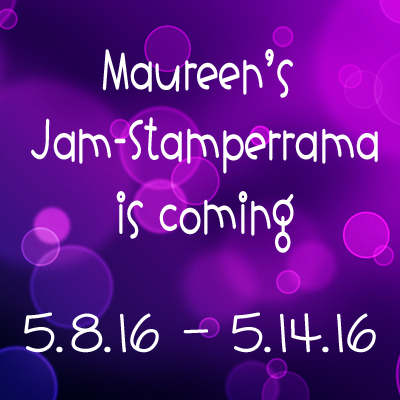 On a somewhat related note, I'm having my Jam-Stamperrama event over on Facebook and there's a chance to win either Jamberry hostess rewards or a stamping prize package!! If you're interested in an invite, please email me (link in sidebar). We're a few days in to the party, but there's still plenty of time to earn raffle entries!! Won't you join us? Hi all! I'm pretty sure you're all interested in stamping, and if you're even just a little bit interested in Jamberry, this is the party for you!! Everybody who joins the party can accumulate points from either the Jamberry Side or the Stamping Side. At the end of the party (before the prize drawing), I will put up a post where you will pick which prize you’d rather win – the Jamberry hostess benefits or the stamping prize package. You can only enter 1, not both. 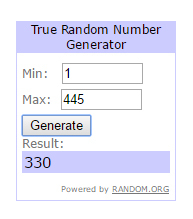 I will then use a random generator to pick the winner, and they will get the prize they chose! What will the prizes be exactly? Well, I can’t tell you that because it all depends on the orders placed for the party. The more you all buy, the bigger the prize! But anybody can win, even without a purchase. Raffle entries given for all sorts of things, like playing games. And no matter which prize you pick to win, you can get entries from both Sides! This is a private event on Facebook. If you'd like an invite, please email (link in my sidebar). There is absolutely no obligation to buy or play or do anything! I just think the more, the merrier! BTW, even if you think you're not interested in Jamberry, maybe that's just because you haven't tried it yet. I didn't get hooked until I tried out the free sample I got from my sponsor. This is a free sample, so you have nothing to lose! Email me your sample choice and mailing addy and I'll send that right out to you! Just a little note: #2 and #8 have clear backgrounds so they're perfect for layering over your own polish! 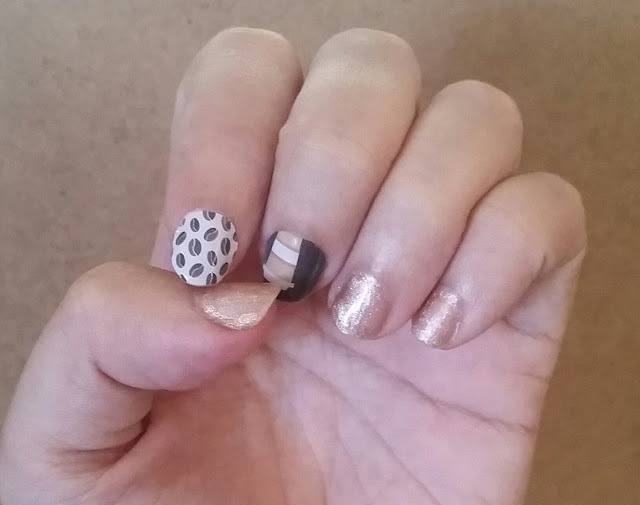 Jamberry wraps also work on acrylic nails! Hope I'll hear from some of you soon! TFL! 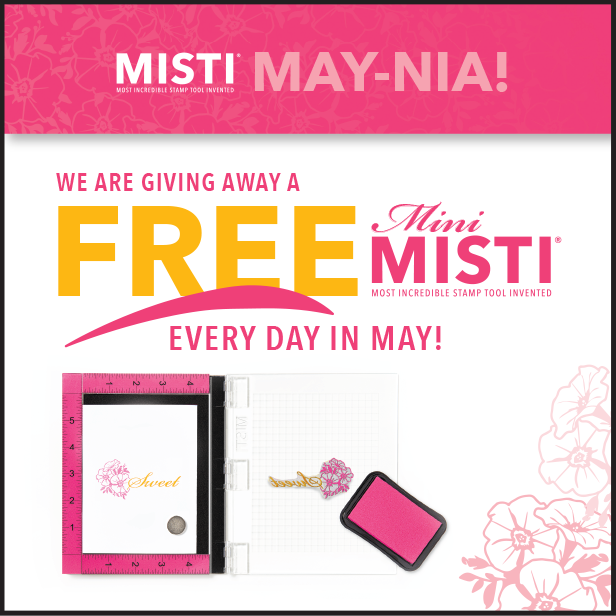 So here's the part you've been waiting for - your chance to win a Mini MISTI!! Please leave a comment - that's it! I would love for you to follow my blog, but it's totally not necessary! You have until May 10 to comment. I will be choosing my random winner on May 11 at 9:00 am Hawaii time. In case you missed any of the posts so far, I've got a list of all of them below. Good luck and thanks for stopping by! 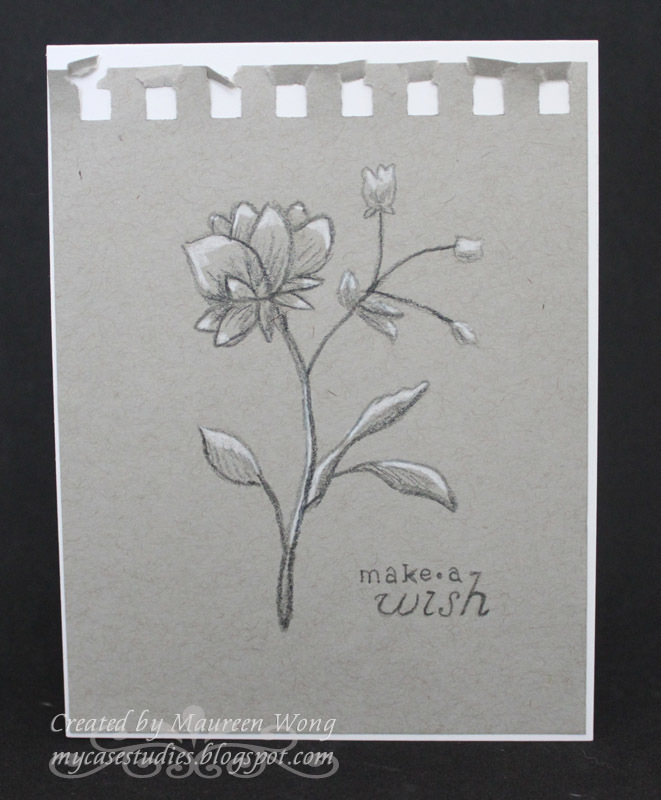 I used the Toned Gray sketch book paper again, as well as the Grout Gray ink. This time, instead of using just black and white pencils, I used 3 different colors and the black. 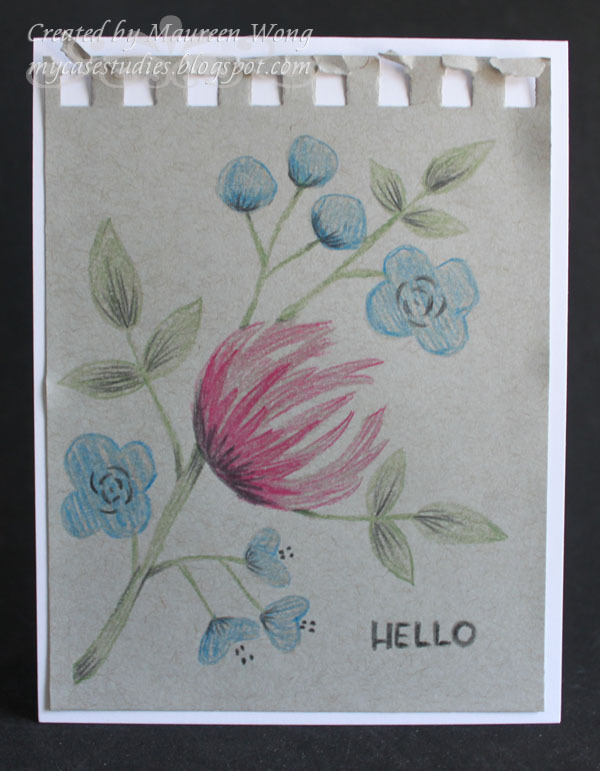 Also, I used Luminance pencils instead of Prismacolor pencils, and the Flourish stamp set from Concord & 9th. I stamped the first step of all the images with the gray ink using the Mini MISTI to help line everything up perfectly, and then traced over them, using a very sketchy motion, with the different colors. For the second step for the leaves and smaller flowers, I just added some detail with the black pencil. 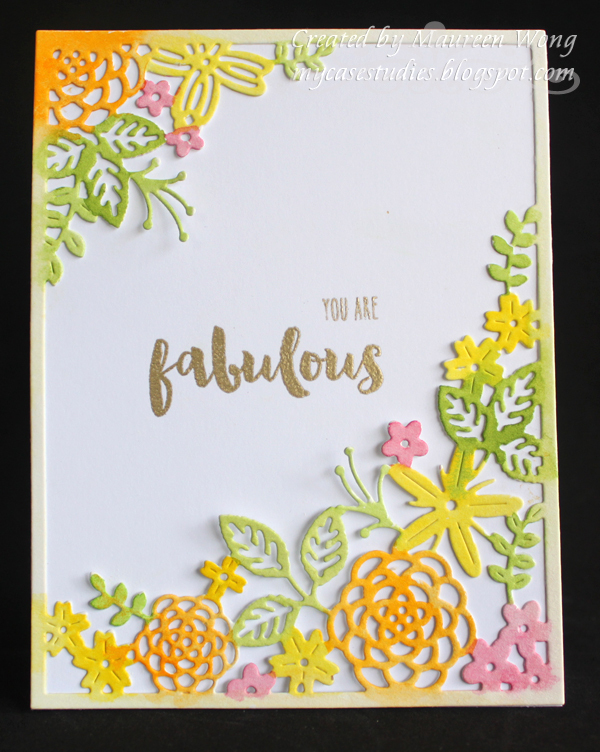 For the bigger flowers, I actually used the Mini MISTI to help me stamp the second steps with the same gray ink right over the colored pencil. I then traced over that second step with the same pink, but pressing harder, on the largest flower. And for the second step on the larger blue flowers, I traced over with black. Finally I added some black detail on the bottom of the pink flower. 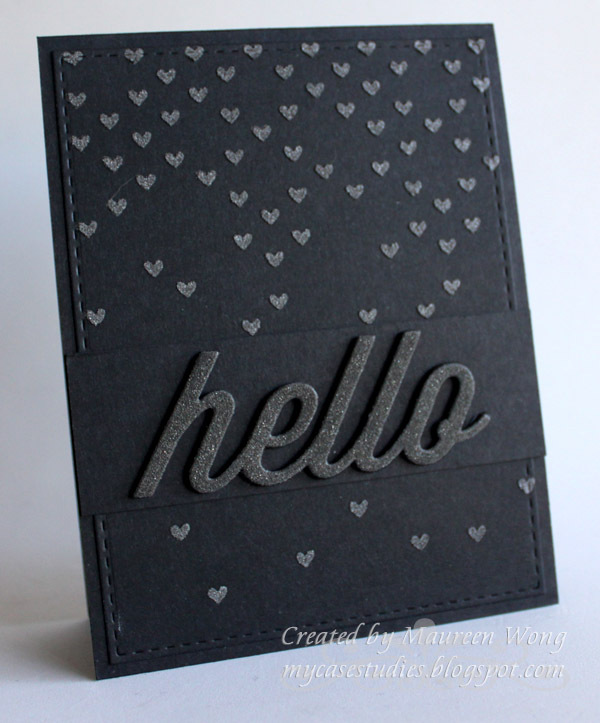 I also stamped the Hello sentiment from the same set with the gray ink, and "sketched" over it with black. 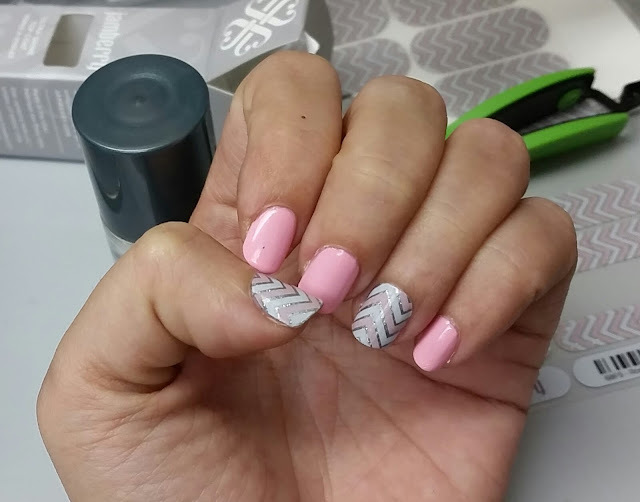 I really like this look and had a lot of fun with this technique and this stamp set! I hope you like my card and now you're off to the awesomeness on the Concord & 9th blog! TFL! Basically I just stamp the image and sentiment in a light gray, trace over all outlines with black, highlight with white, and then shade lightly with black to get more of a gray color. I even trace over the sentiment to make the whole thing look hand drawn. This is for the SSS Wednesday Challenge - Happy Birthday. Hope you like it and TFL! 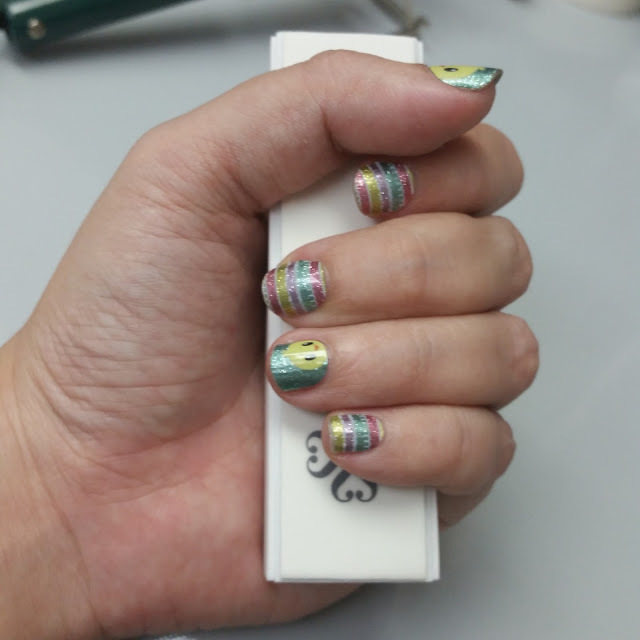 So in an effort to find something else to do, I discovered Jamberry! If you've never heard of it, it's a home sales company that sells products to make pretty nails. Jamberry is probably most famous for their nail wraps, but they also have other products like a complete home gel enamel system and nail care products. This is a Junior size (meant for kids or people with smaller nails) called Glitter Chick. It was hard to capture the gorgeous metallic sparkle, but I think you get the idea! This is another metallic finish wrap called Rose Quartz Chevron. I just used it for 2 accent nails and painted the rest with the matching Rose Quartz Nail Lacquer. Again, I did 2 accent nails with Latte Love and then painted the rest of my nails with the Toasted Gel Enamel which has a great, subtle sparkle. If you'd like to try a sample nail wrap, pick your favorite below and email me your choice and address and I'll send one out to you! Or if you'd like to place an order, there's a link in the sidebar to my site. Thanks!! So that's what's new with me. My mojo is slowly returning so I'll have some cards for you soon! TFL! Hi all! It's been a month since I first bought the Brush Letter Practice Guide (links on the sidebar) so I thought I'd do an update post. Both were done with round brushes - it took me a while to get the hang of it and I'm still practicing! You can see that I had a *really* hard time with the brush on Day 1 - I wasn't getting enough variation between thicks and thins and I had the bristles going all over the place and distorting my letters. Today I have much better control - not many extra paint marks where I don't want them and much better variation between thick and thin. 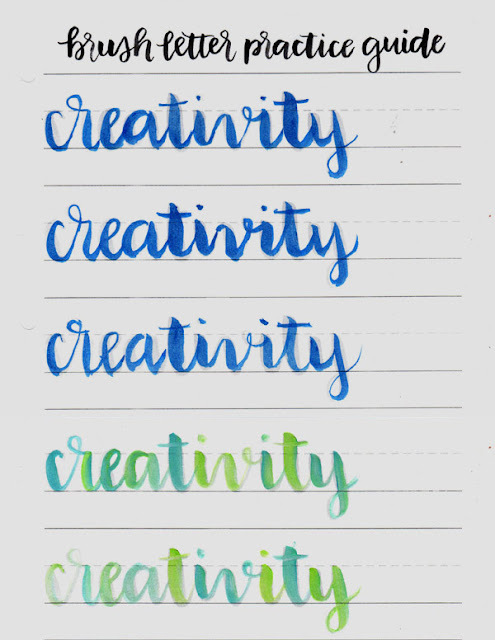 Also you can see that I'm playing with mixing colors during lettering - it makes it even more fun! So here's what I've been doing: I finished all the traceables for the lowercase letters and am slowly working on the uppercase (I've skipped the numbers for now). I have to admit that some of the uppercase letters are really hard and that's why I'm working sloooowly. In January I had printed 3 copies of the Traceables because I really needed the extra practice. Now that I'm getting the hang of it, I've cut down the Traceable for February to 2 copies. I've also printed a bunch of blank lined papers to practice freehand. To me, what makes me practice more is making it fun. And I do that by using a wide variety of paints. 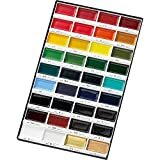 Different types of paints (cheap pan watercolors, more pricey tube colors, shimmery paints, etc.) and lots of different colors. I'll do a linky below of the stuff I've been using. If you're trying out the brush lettering, please leave a comment and tell me how you're doing! I'd love to hear about what's working for other people on this same journey! TFL! It's me. :) I have a card today for a couple challenges. I applied Graphite texture paste through the Falling Hearts stencil and let dry. Then I used the hello die and cut it from black craft foam, black cardstock (PTI), and black glitter paper. I layered them together and mounted on a plain strip of black cardstock. 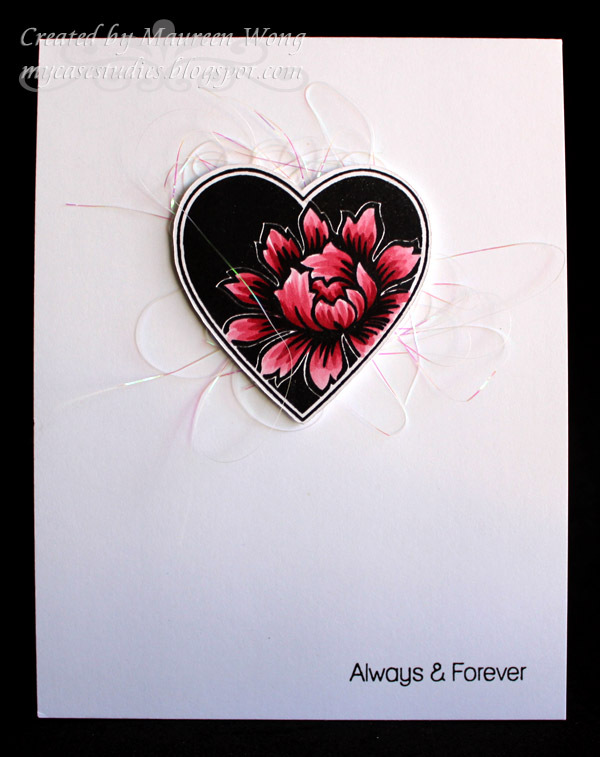 This is also for Crafty Creations - Hearts. I hope you like it and TFL! 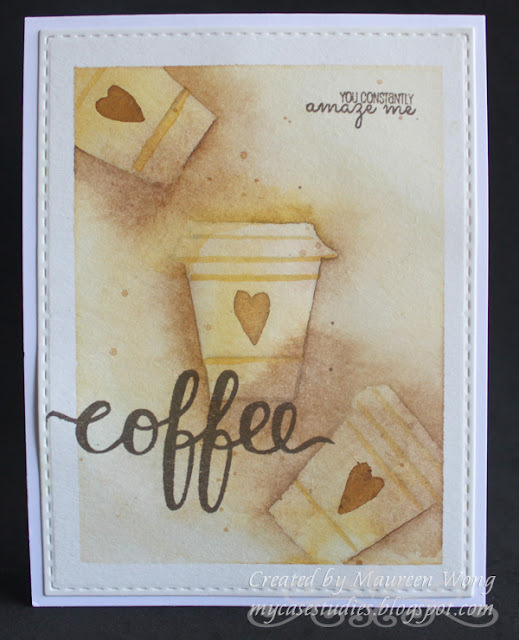 I stamped the heart image using my MISTI with Memento ink and colored with Copics. Then I overstamped (again with the MISTI) with Versafine for a really crisp black finish. I cut it out with my ScanNCut2 and foam mounted it over some balled up iridescent tinsel. Finally I stamped the sentiment with my MISTI in Versafine. I hope you like it and TFL! The heart was stamped with Versamark ink and embossed with Detail Gold EP. 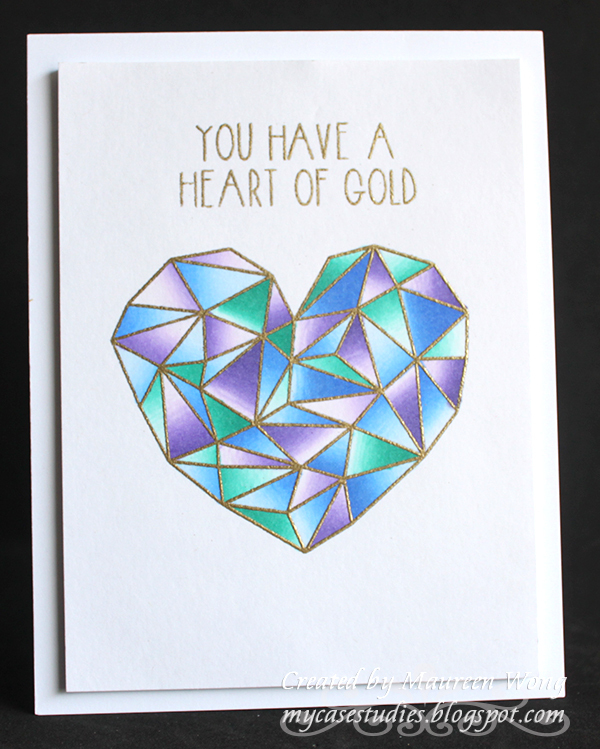 I then watercolored in the little triangles with my Finetec palette in shades of Silver Pearl, Shining Pink, and Green Pearl. I fussy cut it out and mounted it over some gold thread with foam tape. Then I embossed the sentiment with the same Detail Gold powder and cut the ends into fishtails. They are 7.5 ml each. I've seen most other tube paints come in 15 ml or 5 ml, so this is an in-between size. Initially I thought the tubes were a little small, but once I saw how little paint I needed, I realized that there's actually a pretty good amount of paint here. 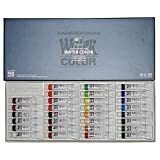 You can see that I've labeled each well with the color name so I'll know which paint goes where. It was really simple with my label maker and 6 mm label tape. The tape is laminated, so it resists the water and paint that goes over the labels. I haven't had any problems yet with the tape lifting or getting messed up. 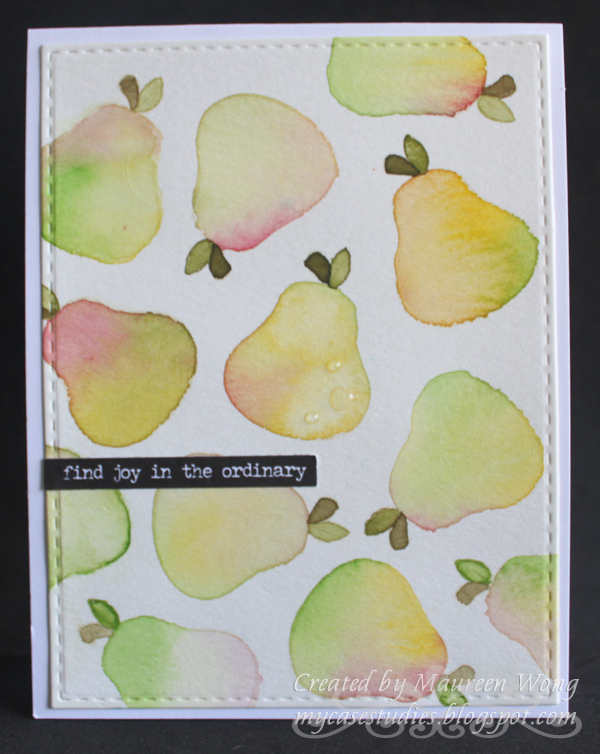 The card above uses a pear image from Your Next Stamp and the card below uses stamps from Create A Smile. That's all for now. 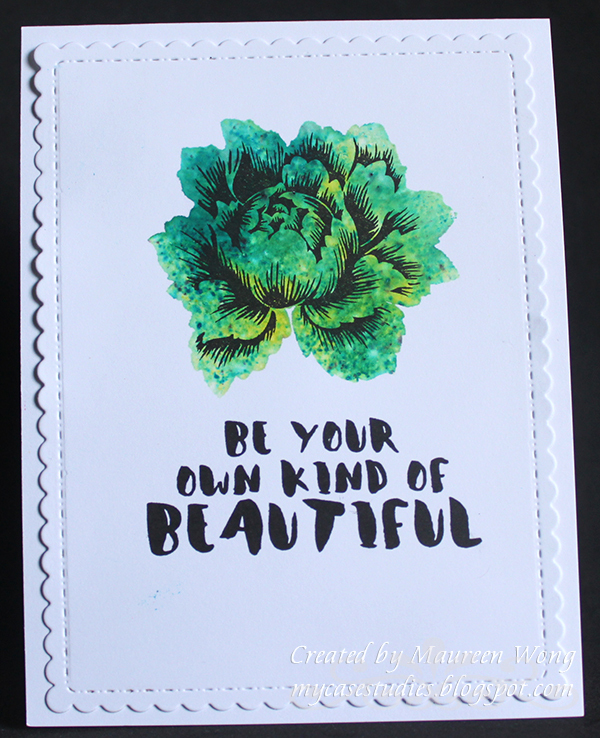 I hope to share more watercolored cards with you in the future. BTW, I'm also using these paints for my brush lettering practice. I know that I can use cheaper paints (meaning not artist quality), but I feel like it's more enjoyable with supplies I really like! *NOTE* Affiliate links used whenever possible at no extra cost to you, so please feel free to click! Thanks!